A range of options to fit your life. 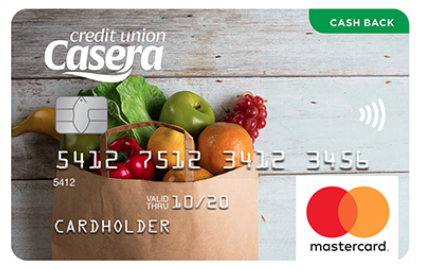 Casera offers a wide range of Collabria Mastercard options designed to fit the active lives of members and their families. The credit cards also have a variety of advantages, including more rewards and travel benefits. Convenience — Accepted at ATMs and POS locations around the globe. Peace of mind — Encrypted chip and PIN technology offers the highest level of card security; round the clock fraud monitoring with mobile text alerts; zero liability — you’re only responsible for online and in-store purchases authorized on your Mastercard account. 24/7 Support — Call 1-855-341-4643 anytime, from anywhere to talk to Collabria Mastercard’s friendly and well-trained support team; report lost or stolen cards, request emergency card replacement, or cash advance. Travel Insurance — Auto collision rental/loss; trip cancellation; trip interruption; lost or delayed baggage coverage; common carrier accident protection; 24/7 travel assistance. FlexRewards — Cards with FlexRewards give you more — points add up quickly, and there’s no limit to the number of points you can earn; get cash back, merchandise and gift cards or choose from worldwide flight options on more than 100 airlines. MyCardInfo — Secure, online access to your account; monitor and manage your account; view account balances and available credit; track, manage and redeem rewards; make a one-time card payment.